The most popular spec's of stock fencing are the 8/80/15 variety available in the light, medium and heavy weight Mild Steel or in the High Tensile HT8/80/15. The letters denote wire type and thickness. The numbers mean the number of horizontal line wires, then the height and finally the space between the vertical drop/stay wires. For example C8/80/15 : C=3.1mm dia top and bottom line wires and 2.5mm middle line wires, 8 = 8 line wires including top and bottom, 80 = 80cm high, and 15 = 15cm between vertical drop/stay wires. HT means High Tensile wire has been used in the product. 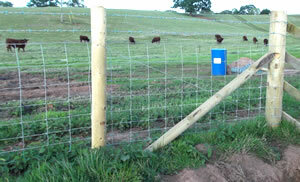 Stock fence specifications vary from animal to animal being fenced in or out. We can offer all types, the most popular ones being kept in stock. Special items are usually just a few days away from delivery. Netting products are kept in stock, various sizes available. Rabbit Wire and Chicken Wire specs are the most popular for pest control in the garden and the vegetable patch.